To remember the slain teenager, an event was held at Ives Estates Park in Miami Saturday. The event, called the ""I am Trayvon, Day of Remembrance Peace Walk," was led by Martin’s parents, Sybrina Fulton and Tracy Martin, at Ives Estates Park in Miami. Martin's parents, who wore green shirts with their son’s image that read "I am Trayvon," held up a large banner with their son's face on it as they led hundreds of supporters in a march for peace. "It's just a beautiful feeling just to know that all of these people are out here and honoring, in remembrance of Trayvon," Tracy Martin said. Foxx, who took the stage to address everyone who attended, said he felt it was necessary to show his support. "When I first saw this story, I couldn't get over it," Foxx said. "I'm absolutely committed to all you out there who have young kids," he said. "I hope you never have to go through anything like this." The star said he hopes to use his voice to keep Trayvon Martin's memory and message alive. "The thing is with press, and you know how press goes, it will be a hot story at one point. It will be the thing to go to and, all of a sudden, they try to forget about it," Foxx said. "And I said I don't want anybody to forget about this, because they can't forget about the fact that they lost their son." Foxx added, "And the thing is, we're not asking for anything out of the ordinary. We're asking for justice." 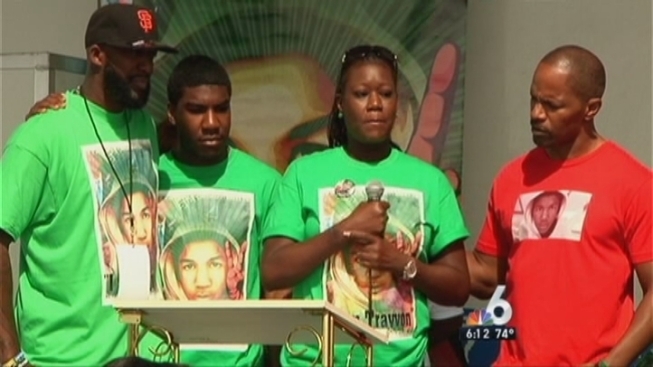 It has been nearly a year since Trayvon Martin, 17, of Miami Gardens, was killed. He was fatally shot in Sanford in February last year during a confrontation with neighborhood watch volunteer George Zimmerman, 28, authorities say. Zimmerman, who says the shooting was self-defense, has pleaded not guilty to second-degree murder in Martin's death. Saturday, Martin's family was thankful Foxx attended the event. "We really appreciate you here, and you always got a family here in Miami," Tracy Martin told him. Foxx closed out the rally by singing a song dedicated to Trayvon Martin.